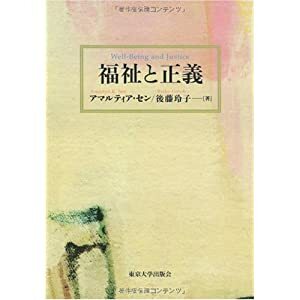 SEN Amartya & GOTOH Reiko "Well-Being and Justice"
SEN Amartya & GOTOH Reiko December 19, 2008　University of Tokyo Press，ix+299p+viii. This book is a fruit of economics. Welfare strives for realization of individuals’ well-being while justice questions the way of its realization. ‘Well-Being and Justice’ will require further development of economic thought and its precise and bold turning points.